Can Dogs Get Enough Exercise in the Backyard? Dog Myths Debunked: Can Dogs Get All the Exercise They Need in the Backyard? Most dogs love spending time outside, and backyards provide a space for their favorite activities, like playtime and training sessions — not to mention the joys of fresh air, sunshine, and rolling around in the grass. But can dogs get all the exercise they need in the yard? You may have heard someone say, “My dog just needs a home in the country with a big yard.” This phrase is often used as an excuse for hyperactivity or obesity, but a big yard alone won’t solve these problems. Like us, dogs need mental stimulation and regular exercise to stay happy and healthy. They also share our social natures. When you watch your dog out in the yard, you may have noticed that he spends a lot of time lying in his favorite spots, rather than running around. After all, playing catch with yourself is nowhere near as fun as playing with a friend, and most dogs need encouragement from their owners to exercise. Regular games of fetch, training sessions, and playdates with other dogs in the backyard are all great ways to keep your pup in shape. Exercise in the yard, however, isn’t enough. Imagine spending all your time at home. Even the best home fitness center and an endless supply of your favorite books and TV shows might get boring after a while. Dogs are no different. The sights, sounds, and smells of the world beyond your house offer much needed stimulation, and help prevent destructive, boredom-related behaviors like barking and inappropriate chewing. Plus, time outside the home exposes your dog to new experiences, which is essential for continued socialization. As tempting as it might be to leave your dog to play in the yard for long periods of time, there are some serious risks to consider. Extremes of heat and cold can negatively impact all dogs. Some breeds, like brachycephalic breeds (dogs with a flat and wide skull shape), are especially heat intolerant, while others, like Italian Greyhounds, are cold intolerant. Leaving these dogs in the yard unsupervised can lead to heat stroke or hypothermia, and even mild days can be too warm if your dog does not have adequate shade and shelter from the elements. Weather conditions are not the only threat. Small dogs make appealing targets for wildlife like coyotes and hawks, and potential theft is a real concern for many dog owners. Sometimes our dogs are their own worst enemy. Enthusiastic chewers might ingest a foreign object or choke on a stick or toy. Escape artists may dig, climb, or squeeze their way through fences, and backyards with pools pose the risk of drowning. 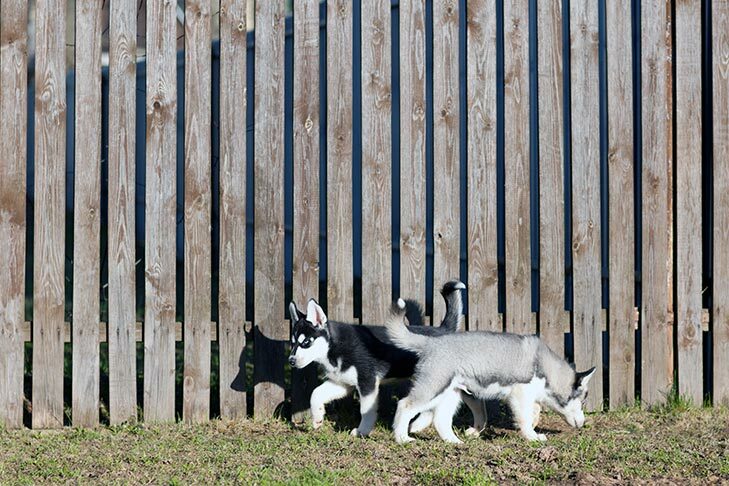 The safest way to encourage yard play is to make sure you or another trusted person are present. 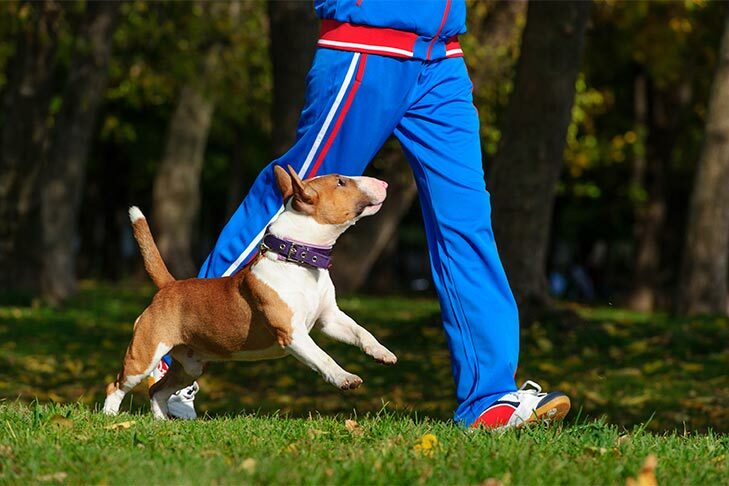 The amount of exercise your dog needs varies from breed to breed. High energy breeds like Labrador Retrievers and Border Collies need at least an hour of intense exercise most every day, while brachiocephalic breeds like Pugs and Bulldogs may be content with a few short walks. Talk with your veterinarian about your dog’s exercise requirements and how to safely work fitness into your dog’s routine if he has any complicating health issues. Yards do have their place in your dog’s exercise routine. We don’t always have time to take our pups for long walks. Family and work obligations get in the way, and some days, we are just too tired to take our canine companion for a jog. Yards offer a convenient alternative. A high-energy game of fetch and some obedience training can still go a long way.